Fact: Northwestern students need to get into Chicago more. With one of the country’s greatest cities visible from our campus, there’s no excuse not to experience it. Personally, I am a firm believer in the power of food (restaurants specifically) as a way to explore a city. But, unfortunately, that kind of exploring isn’t free. As college students, we’ve all had that eager urge to escape the dining halls and head to a nice restaurant, only to realize that our pockets aren’t deep enough to do so. We look for solutions, but perusing sites like Groupon for the occasional restaurant deal can be time consuming and won’t necessarily guarantee coupons to Chicago’s greatest culinary spots. For those of us who enjoy quality food, but need to save money, á la card may just be our saving grace. 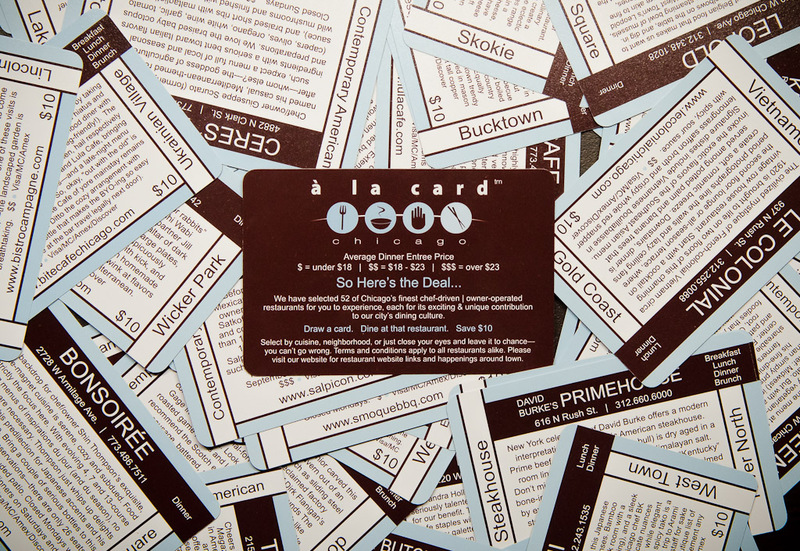 Á la card offers a 52-card deck, and each card is a $10 coupon at a different Chicago eatery. These aren’t your average Chicago restaurants, though. Every establishment is independent, most are critically acclaimed and some, including Naha and Longman & Eagle, are even Michelin-star status. The possibility of decreasing the price of a Michelin-star meal from $40 to $30 may just push you to trek to Chicago and splurge a little bit. The deck costs $30. Yes, that’s right – $30 for a $520 worth of discounts. Also, if you pre-order the 2013 deck, you get a FREE 2012 deck in case you just can’t wait to eat a $15 Michelin star brunch at Longman & Eagle before the year ends. And don’t think that á la card only offers discounts to fine dining establishments, though. Widely renowned restaurants like Hot Chocolate or Big Jones turn dining experiences that may have been a little regretful seeing that $20 bill fly away into one that is both delicious and reasonable. 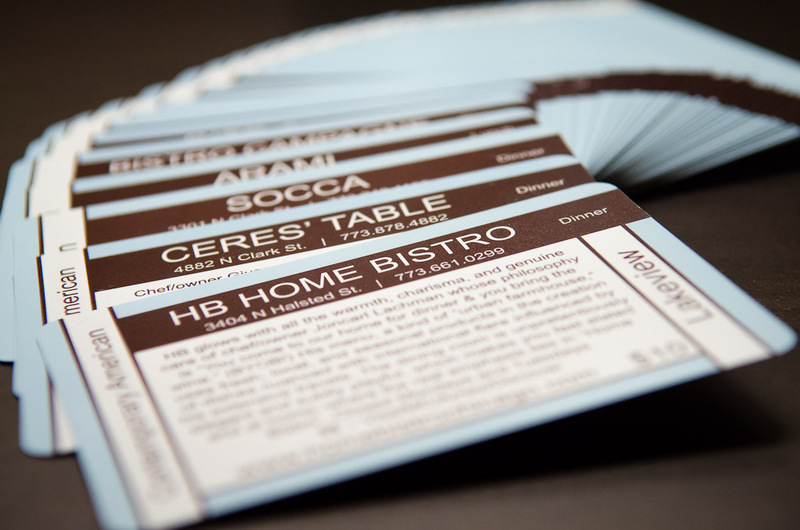 In case you needed another reason to get into the restaurant game, $1 from the sale of each deck of cards is donated to Common Threads. Common Threads is a non-profit that, according to á la card, aims “to educate children on the importance of nutrition and physical well-being, and to foster an appreciation of cultural diversity through cooking.” Art Smith, who some may recognize as Oprah’s former personal chef, is a co-founder of Common Threads. Low-income children in the Chicago area that are involved with Smith’s non-profit immerse themselves into the food world, and learn basic kitchen techniques, as well as the significance of using fresh, healthy ingredients to lead to a healthy lifestyle. So what are you waiting for? Go get a deck, fill your stomach and experience Chicago.